The Van Gogh Museum says it has identified a long-lost Vincent van Gogh painting, the first full-size canvas by the Dutch master discovered since 1928. Sunset at Montmajour depicts a dry landscape of oak trees, bushes and sky, painted with Van Gogh's familiar thick brush strokes. It can be dated to the exact day it was painted because Vincent described it in a letter to his brother, Theo, and said he painted it the previous day – July 4, 1888. He said the painting was done "on a stony heath where small twisted oaks grow." Museum experts said the painting was authenticated by Van Gogh's letters, the style and the physical materials used, and they had traced its history. Museum director Axel Rueger described the discovery as a "once-in-a-lifetime experience" at an unveiling ceremony. "This is a great painting from what many see as the high point of his artistic achievement, his period in Arles, in southern France," he said. "In the same period he painted works such as Sunflowers, The Yellow House and The Bedroom." The museum said the painting now belongs to an unidentified private collector and will be on display at the museum from Sept. 24. It did not disclose full details of how the painting had been recovered, but said that it had been owned by a Norwegian man who had been told it was not by Van Gogh, so it languished for years in his family's attic. Rueger said the museum had itself rejected the painting's authenticity once in the 1990s, in part because it was not signed by the artist. But a new two-year investigation had convinced them, with new techniques of chemical analysis of the pigments showing they were identical to others Van Gogh used on his palette at Arles – including typical discolorations. Meanwhile, an X-ray examination of the canvas showed it was of the same type Van Gogh used on other paintings from the period, such as The Rocks, which hangs in Houston's Museum of Fine Arts. Researcher Teio Meedendorp said he and other researchers "have found answers to all the key questions, which is remarkable for a painting that has been lost for more than 100 years." The painting was listed among Theo van Gogh's collection as number 180, and that number can still be seen on the back of the canvas. The work was sold in 1901. 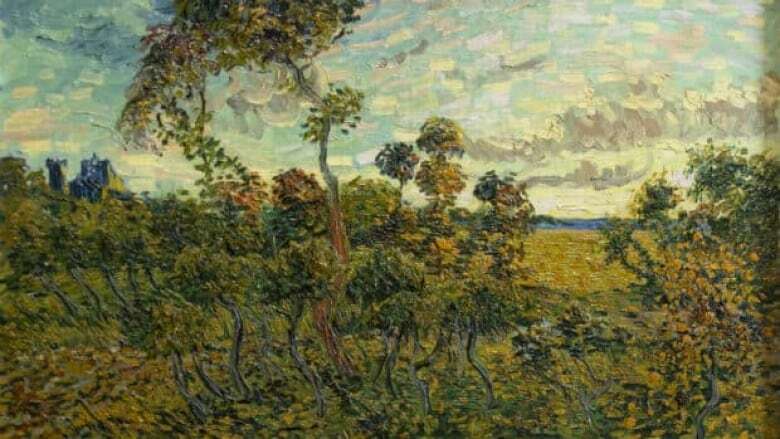 Rueger described Sunset as ambitious, because the canvas is relatively large, at 93.3 by 73.3 centimetres. Van Gogh referred to the work in two other letters in the same summer it was painted, saying he was trying to present himself as a "poet" among landscape painters — but he said he considered Sunset a failure in several respects. He made similar remarks about some of his most famous paintings, including the 1889 Starry Night that hangs in the Museum of Modern Art in New York. Vincent Van Gogh struggled with bouts of mental distress throughout his life, and died of a self-inflicted gun wound in 1890. He sold only one painting while he was alive, though his work was just beginning to win acclaim when he died. The Van Gogh Museum, which houses 140 of the Dutch master's works, receives more than a million visitors annually, and Van Gogh paintings are among the most valuable in the world, selling for tens of millions of dollars on the rare occasions one is sold at an auction. The exact location Sunset depicts can be identified: it is near Arles, France, where Van Gogh was living at the time, near Montmajour hill, and the ruins of an abbey of the same name. The abbey can be seen in the background of the work, on the left side. Researcher Meedendorp said the work was at a "transitional" moment in Van Gogh's style. "From then on, Van Gogh increasingly felt the need to paint with more and more impasto (thick strokes using lots of paint) and more and more layers," he said.